Express yourself, Madonna, but don't preach! 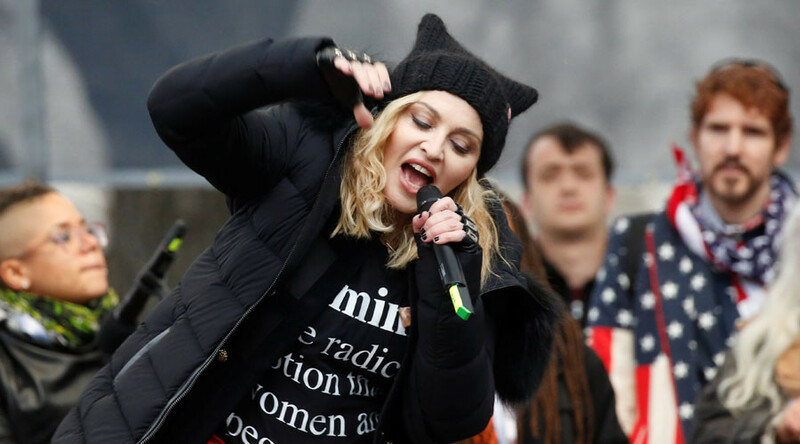 At the Women’s March on Washington this past Saturday, Madonna tried to cut President Trump down to size with an impassioned speech, but she ended up helping her opponents and hurting her cause. Let me say right up front that I am not one of those people who thinks celebrities should never talk about politics. I feel that all Americans, celebrities included, should share their thoughts as they see fit. Of course, I also believe that people, celebrities most especially due to the size of their audience, should be held to account for what they say. Which brings us to Madonna and the Women’s March on Washington inauguration weekend. At the anti-Trump/pro-woman event this past weekend, Madonna gave a profanity-laced speech where she said, in part, “Yes, I am angry. Yes, I am outraged. Yes, I’ve thought about blowing up the White House." No doubt the Secret Service are drawing straws right now to see who gets stuck with the miserable assignment of interviewing the erstwhile Material Girl. While most people will chalk up Madonna’s statement as just a bit of emotionalist nonsense, the Secret Service, sadly for them, don’t have that luxury. While the 58-year-old, former pop princess isn’t entirely culturally irrelevant, she can certainly see irrelevance from her backyard. Madonna’s artistic insignificance aside, her diatribe at the rally this past weekend will no doubt bring her some much-desired attention, but it will also most certainly undermine the anti-Trump cause for which she alleges to be speaking. Problem number one with Madonna’s speech is that you cannot decry what you consider to be Donald Trump’s outrageous statements by making outrageous statements of your own. Doing so only serves to highlight your hypocrisy and diminish and normalize what you believe to be Trump’s inappropriateness. Also, violent speech, whether it comes from Madonna or Trump or anyone else, simply cannot be permitted to stand unchallenged in the public square. Violent speech eventually can lead to violent action. This was on display at a Trump rally in North Carolina during the campaign where a protestor was sucker-punched by a Trump supporter after candidate Trump had talked of getting tough with unwanted agitators. Conversely, this past weekend, alt-right leader Richard Spencer got punched in the face in broad daylight by a masked man while giving an interview on a street corner in Washington D.C. Regardless of what you may think of the protestor at the Trump rally or of Richard Spencer, there can be no tolerance for violence toward people because of their political beliefs. If you can’t convince people of your argument with your words, you certainly won’t convince them with your fists. Speaking of failing to convince people of your arguments, who, exactly, was Madonna trying to sway with her diatribe? Like Meryl Streep’s recent speech at the Golden Globes, Madonna’s tirade was not meant to persuade anyone, only to preach to the already converted. Madonna and Meryl both gave their immediate audiences what they wanted, and got the cheers they expected; the problem though is that while their speeches were directed toward those who agree with them inside the Hollywood bubble, ‘regular’ people in flyover country heard them as well. Among those flyover folks are the swing voters Democrats need to convince if they want to stop Trump and get back into power. I am willing to bet those 80,000 or so working class white voters, or as I call them “Springsteen voters”, who voted Obama twice and put Trump over the top in Pennsylvania, Michigan, Ohio, and Wisconsin in 2016, were less enamored with Madonna’s screed than the true-blue liberals cheering her at the Women’s March. I am not a Trump voter or supporter; the truth is I dislike him “big.” That said, he is spot-on about that last part, “Celebs hurt cause badly.” Trump knows his target audience extremely well, and he is well aware that Americans in the Heartland, chief among them the “Springsteen Voters”, are tired of being preached to and looked down upon by liberal coastal elites. So anytime a celebrity or the media attacks him, Trump gets considerably stronger, as his opposition gets weaker. While Madonna’s rant may have felt good to her personally and momentarily excited her cohorts in the Democratic base, it was terribly counter-productive regarding a strategic resistance to Trump. Madonna and Meryl Streep are both so deeply entrenched in their own epistemic echo chamber that they are unable to grasp how their harangues are heard by the great, unwashed masses in Middle America. To swing-voting ‘regular’ Americans, these anti-Trump speeches are not heard as heartfelt emotional rebuttals against President Trump, rather they are heard as the self-serving tantrums of spoiled entertainers. If celebrities want to truly help their cause and hurt Trump, they need to stop thinking and acting emotionally and start thinking and acting strategically. Instead of urgently reacting to everything Trump says, they should methodically and rationally respond to what Trump does. They should be all the things they claim Donald Trump is not; they should be measured, calm and thoughtful. Before they utter a single word, they should think about how those pivotal "Springsteen Voters" in the Rust Belt will hear the message they are trying to convey. 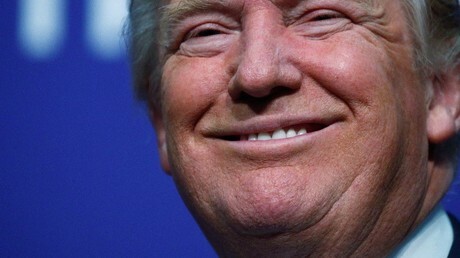 Those swing voters can be convinced, and Democrats have swayed them before, so instead of calling them racists or idiots or misogynists because they voted Trump, liberals should lick their wounds and then set out to methodically persuade them back to their point of view using logic and reason and not emotion. One final point, here is a piece of anecdotal evidence I will share with you. On the day after the Women’s March, I had a discussion with my neighbor here in Los Angeles. She is a woman in her late thirties originally from Pennsylvania (everyone who lives here is from somewhere else). When the subject of the Woman’s March came up, she told me that “all of her female friends” had gone to the march. I was surprised and impressed to hear this, and it made me think the rally and resistance to Trump had a broad base and were very widespread. I then rattled off a list of names of her friends from Pennsylvania, asking if they went to the march. This conversation is one of the reasons why I believe that Madonna and other celebrities fail so miserably when they carelessly attack Trump. 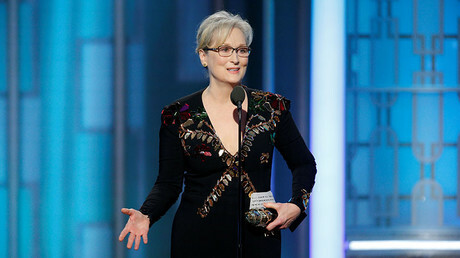 Madonna and Streep’s fellow travelers in the liberal big cities will cheer their every word, but the “Springsteen Voters” who can make the electoral difference in Michigan, Ohio, Wisconsin and Pennsylvania, will either tune out, be turned off to the liberal cause or be turned on to Trump at the sound of celebrity political pontification, even when it comes from their idol Bruce Springsteen. I am sure Madonna felt invigorated giving her speech surrounded by adoring fans this past Saturday, but she won’t feel so great when she has to give another speech to the same group of down-trodden liberals after Trump’s inauguration in January of 2021. If these celebrities care about the anti-Trump cause, they would be most wise to think long and hard before assailing him so recklessly.